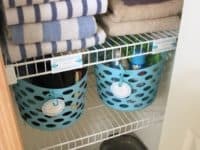 In our bathroom, we have the same problem as we used to have in our kitchen; it’s spotless in terms of actual cleanliness, but a lack of storage definitely makes us guilty of disorganization on occasion! 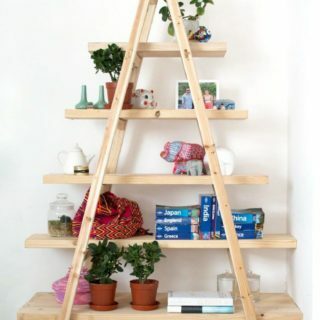 That’s why we’ve always got our eyes peeled for small DIY projects we can make there that will help us out by giving us new places to put the things that otherwise create clutter. 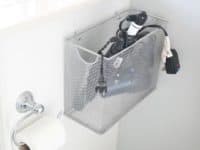 Just in case you could used some creative suggestions for small bathroom storage solutions too, here are 15 of the simplest, and most useful projects and ideas we’ve come across so far in our search for guidance and inspiration! 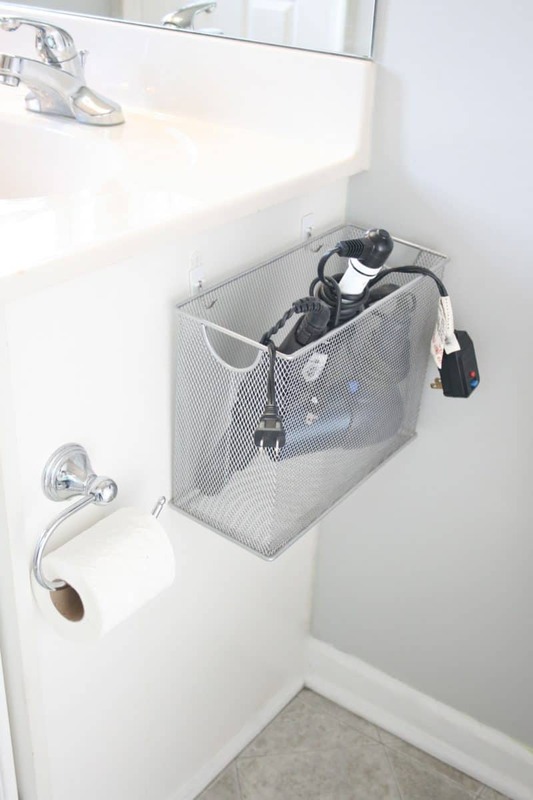 Are you growing tired of just stashing the new bag of toilet paper next to the toilet where it has to be struggled out of the plastic, or perhaps piling it there plastic-free where one of the kids inevitably knocks the whole stack over? 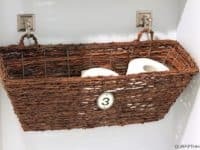 Then we have a feeling you’ll be quite glad to come across this idea from Our Sixth House that shows you how to simply wall mount a wicker window box planter near the toilet and use that to store your new toilet rolls in instead! 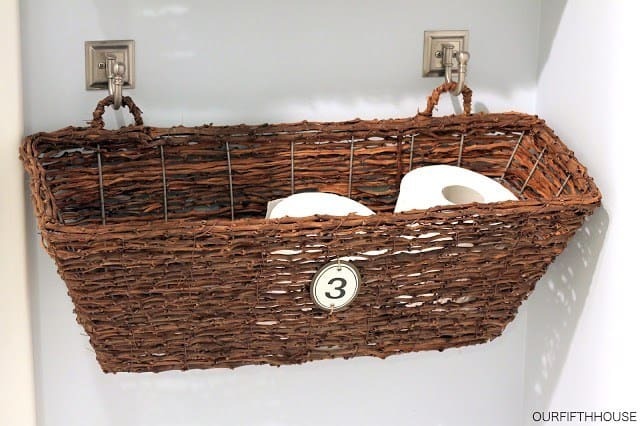 The idea of wall mounting a basket of some kind is actually one that’s useful just about anywhere in a bathroom that lacks counter space and cupboards! 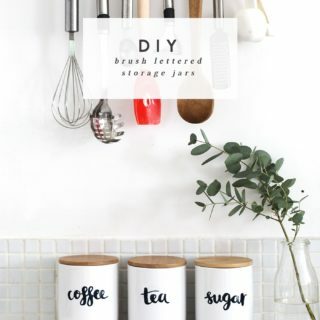 We’re pretty big fans of this idea for doing a similar thing as you saw above but this time with a long file box because that’s a better shape for hair utensils like hair dryers and straighteners! 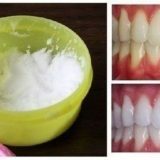 Take a look at this tutorial from Dream Green DIY to see how easily it can be mounted on the side of your sink counter. 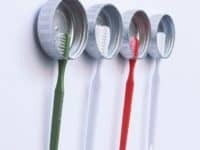 Have you been looking for a simple and budget friendly way to help the kids organize their toothbrushes because you don’t want them leaving them all over the counter but putting them in a cup didn’t work because they forgot which one belonged to who? 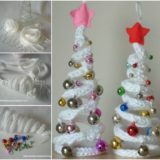 In that case, we definitely think you should take a look at the way Oh Oh Deco had their kids help them make toothbrush wall hangers from pop bottle lids that simply Velcro right to the wall. 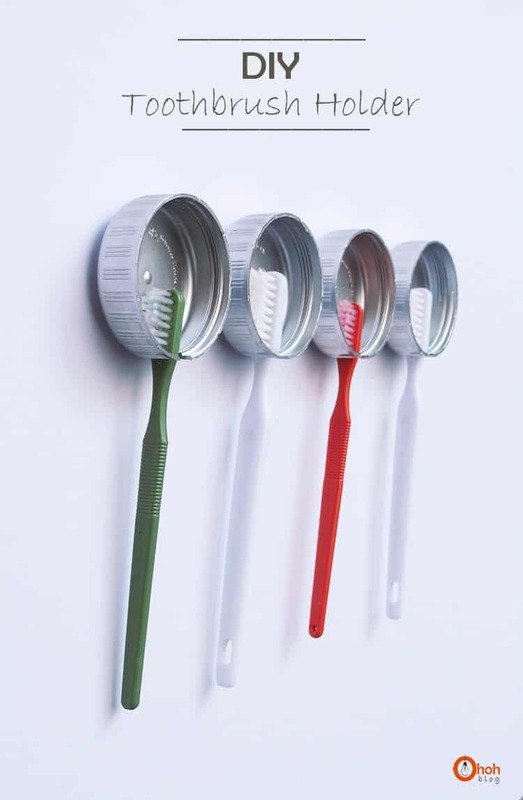 This way, the toothbrushes are out of the way, they dry well, and your kids have a colour and a spot on the wall to help them remember which one is theirs. 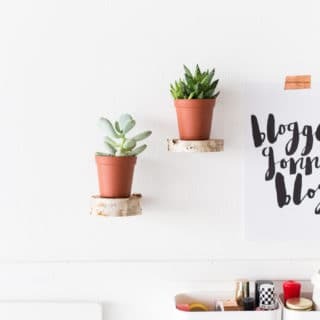 Maybe you’re feeling like you could really use an extra shelf or two in your bathroom but you’ve hesitated because you haven’t found any small enough for your very tiny space just yet? 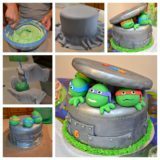 Well, that’s why we thought this concept from Kevin & Amanda was such an interesting one! 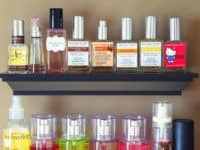 Instead of installing full sized shelves, they used crown moulding to create ledges that fit small bottles like perfume and face lotion absolutely perfectly. 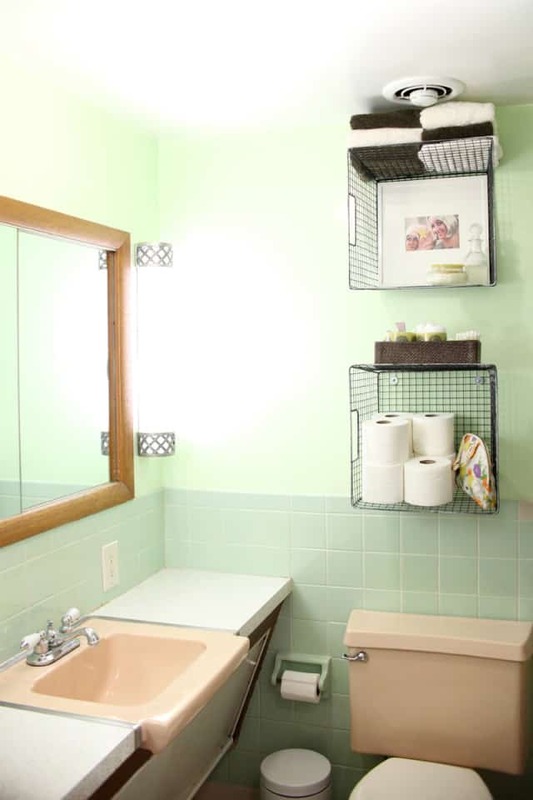 Are you actually pretty proud of the way your bathroom looks organized but you also know that the illusion is shattered the moment you open the doors to the cupboard under the sink? 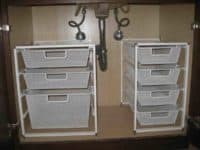 In that case, we have a feeling you might get along better with a suggestion like this one from Hi Sugarplum for using some standing dollar store drawers to free up some of the clutter and keep things a little more contained down there. 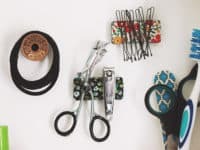 Are you absolutely in need of a place to store your hairstyling tools like we talked about a little earlier on our list but you’re not really a fan of the file box idea because you’d rather not have to tangle the right tool and its cord out of a box each time you need it? 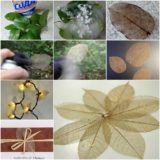 In that case, we have a feeling you might prefer the way The Frugal Female stuck a series of wall hooks to the inside of their bathroom cupboard door and hung a tool on each one! 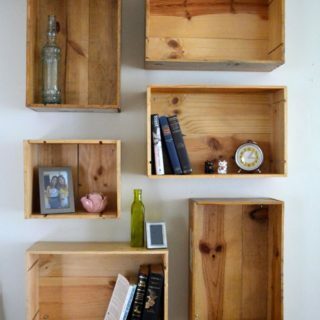 If you’ve got a little bit of floor space to work with but you’re finding it hard to find a piece that suits your bathroom’s aesthetic and is also wide but short enough for what you need, why not make something custom from crates instead? 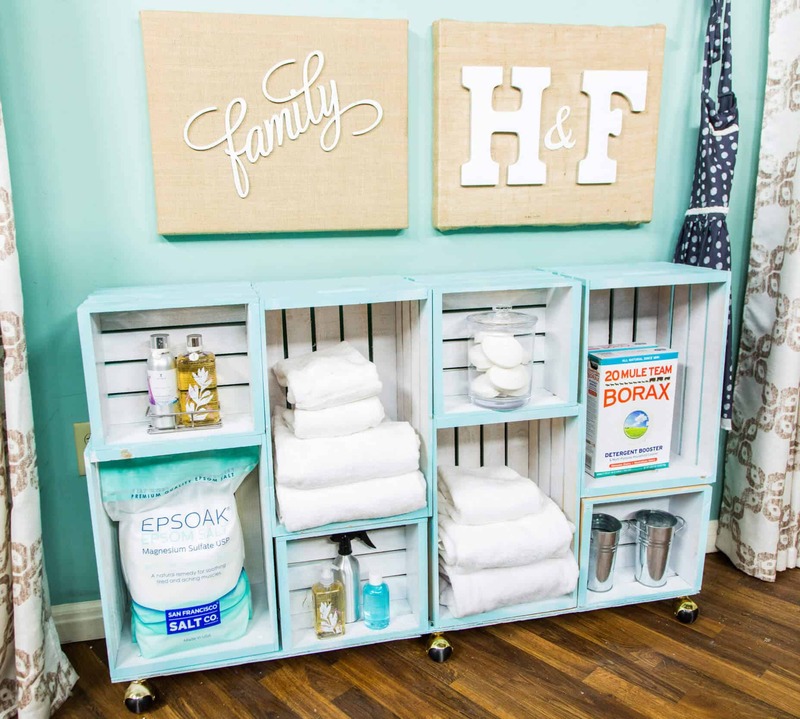 We adore the way Hallmark Channel built this stacked shelf using different sizes of painted crates oriented in different ways to create all kinds of new storage space! 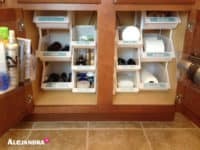 Are you intrigued by the idea of putting something underneath your cupboard that will help you keep it organized but you’re just not sure actual drawers will fit under your little apartment sink? 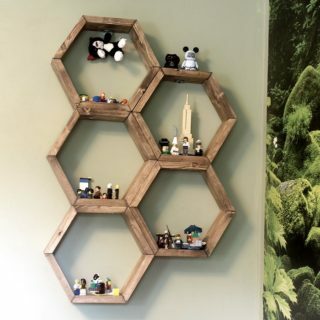 In that case, we’d definitely suggest taking a look at how Alejandra got their space together using stacking bins instead! 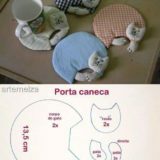 We like that they even stuck a couple on the inside of the doors, just to really maximize on their available space. 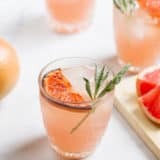 Are you actually feeling a little bit more hands-on and up for a challenge, since you’re a very handy person indeed, so you’re thinking about putting your simple woodworking skills to good use? 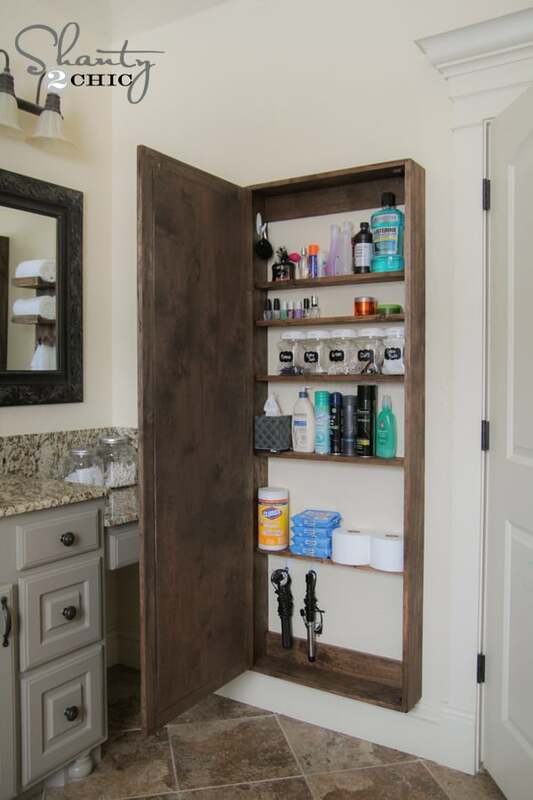 Well, if you’ve got some spare wall space to work with but not much space on the floor for the kind of full length shelf you really need, we’d definitely encourage you to take a look at this wall mounted, mirror doored bathroom cupboard outlined in full on Shanty 2 Chic instead! 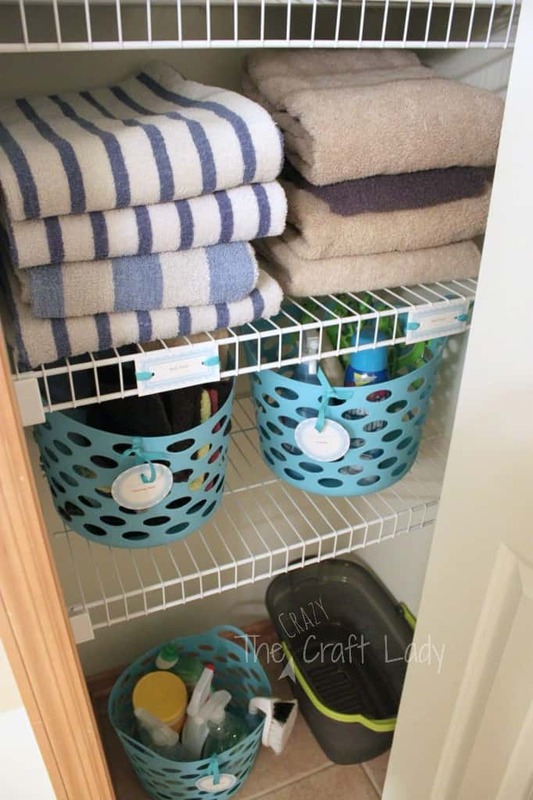 Are the things you’re looking to organize the most in your bathroom actually smaller things that you’re simply tired of having scattered across the counter tops? 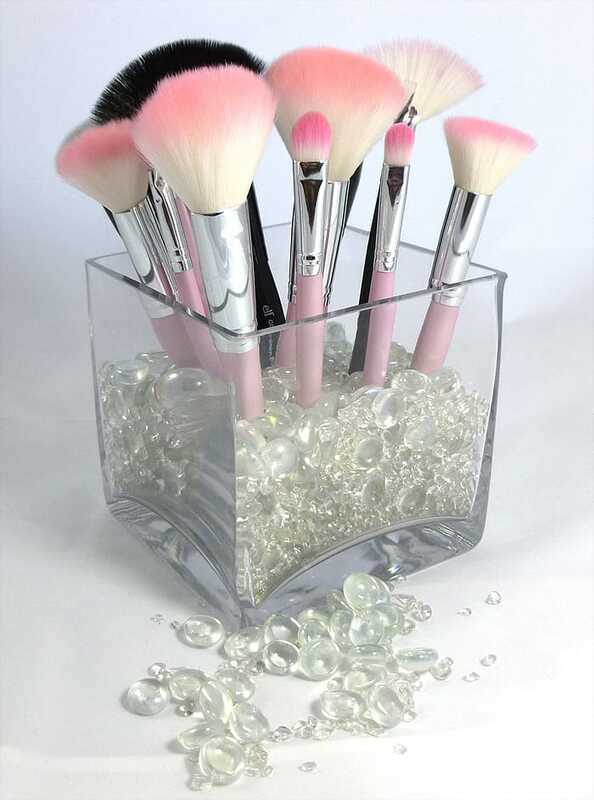 Well, if makeup brushes are part of the problem, we’d absolutely suggest taking a look at how Hairspray and High Heels made a little storage bin for theirs out of a glass vase filled with clear planter beads. 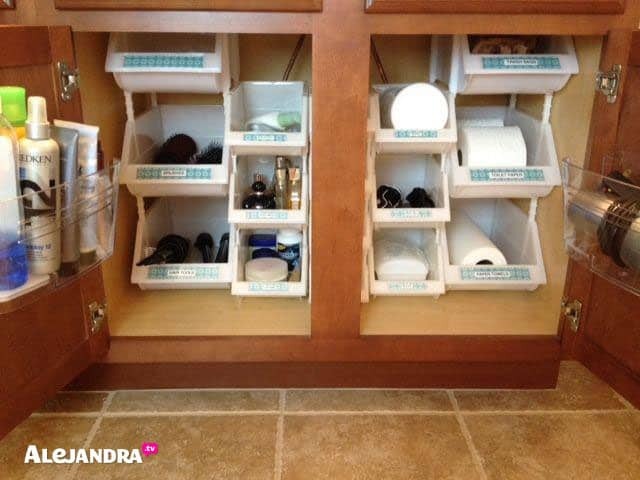 Just like bins and drawers can help keep the space underneath the sink more organized, we find that placing a few bins on the shelves in the bathroom closet helps us keep other parts of our bathroom clutter free too! 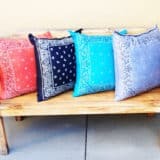 The Crazy Craft Lady shows you how it gives you a place to put a whole mix and match of things that might not have a home otherwise. 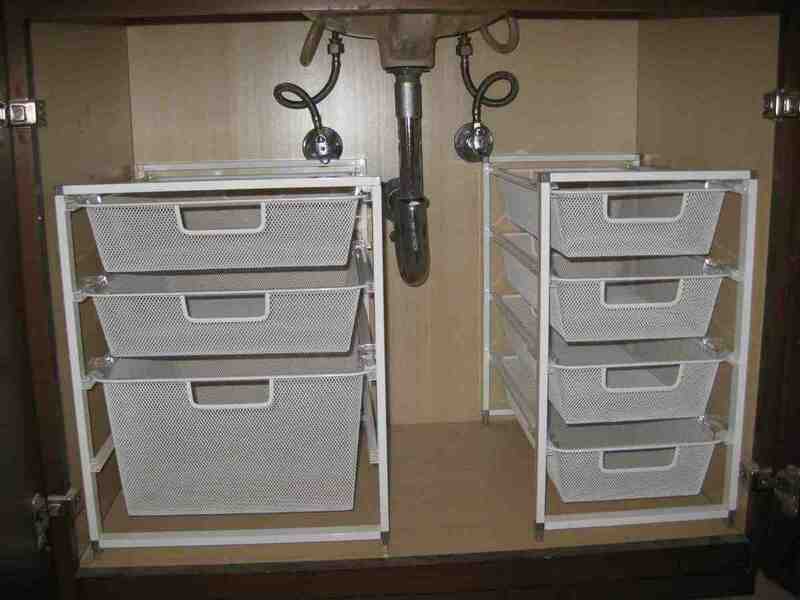 Were you actually quite a big fan of the way you saw crates turned sideways in order to create cubby storage but you don’t have the room to stack crate shelves on the ground? 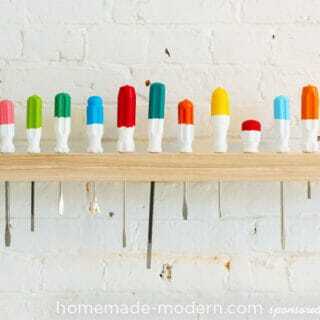 Then maybe you’d get along better with this wall mounted concept that works similarly, but using lighter wire baskets! A Beautiful Mess shows you how it’s done. 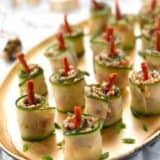 When it come to really maximizing on all available space where there’s any space available, sometimes you just have to put a shelf wherever you possibly can! 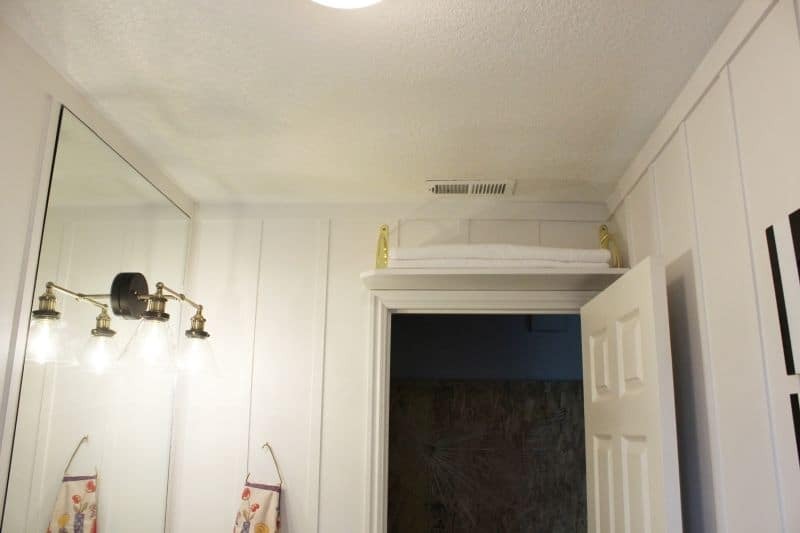 That’s the logic Homedit was operating on when they installed a shelf for spare towels in the space right above their bathroom door and, honestly, we think it’s kind of genius. 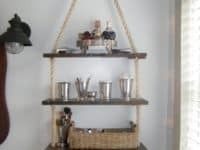 Have you actually been scrolling through our options hoping to find a shelving idea that’s a little more crafty but not quite as hands-on as the previous wooden shelf idea with the full length mirror that we showed you before? 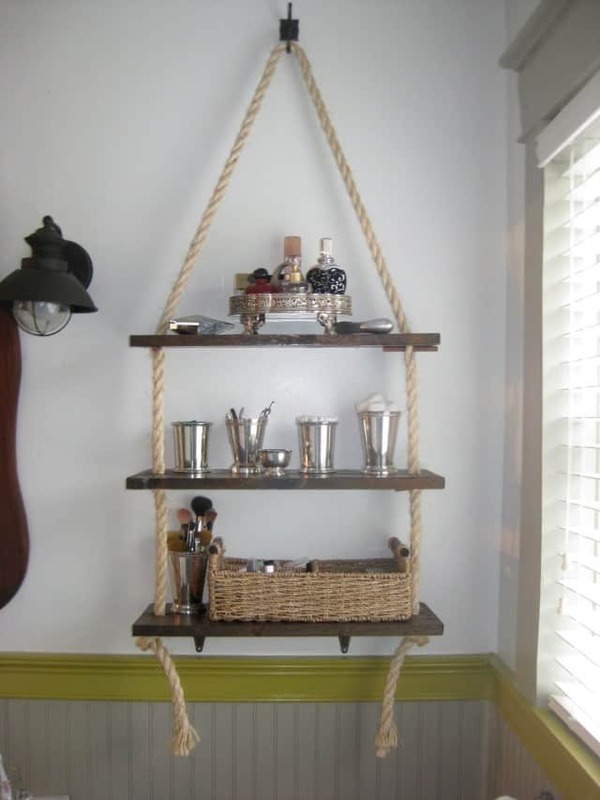 In that case, particularly if you enjoy rustic aesthetics, we’d absolutely suggest taking a look at how At The Walker House used planks, thick rope, and knotting techniques to make a fantastic hanging shelf that’s much more balanced and sturdy than it looks. 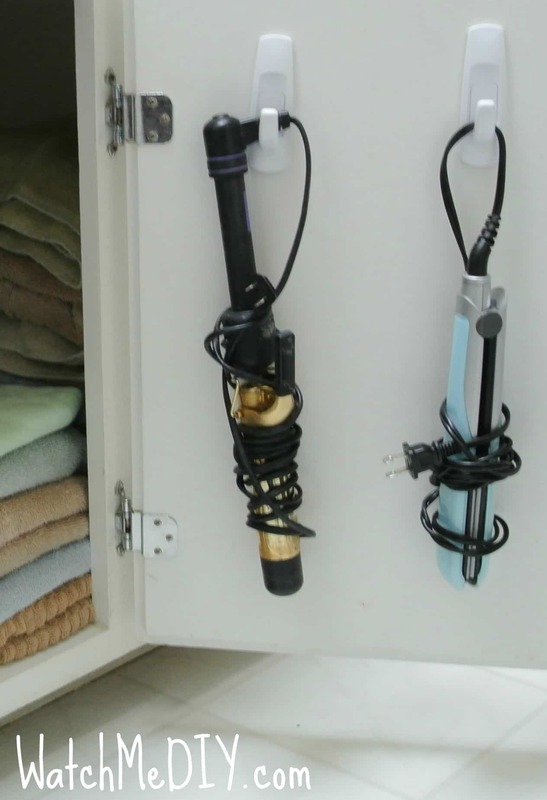 Did we really catch your attention when we started talking about finding ways to store the tiniest bits of clutter in your bathroom because that’s what takes up the most space on your counters, but organizing makeup brushes isn’t an issue for you? 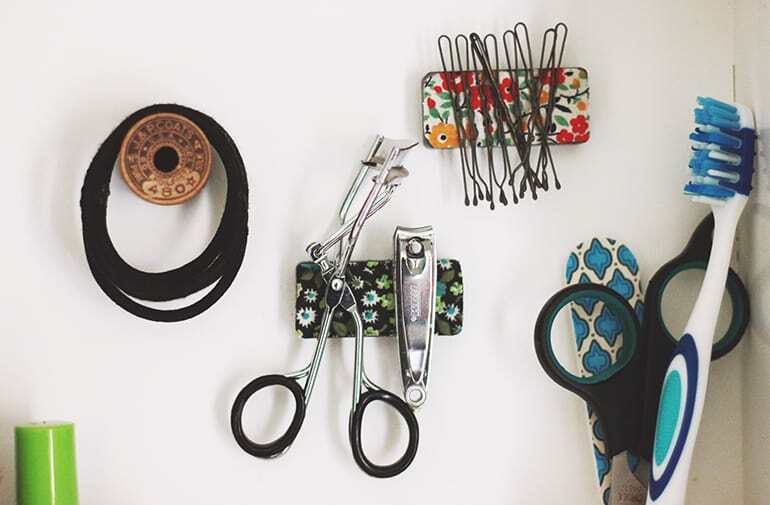 Then maybe you’d have better luck with something like these medicine cabinet magnets from The Merry Thought that are great for keeping things like bobby pins and nail clippers in place!